My buddy Arpit and I were discussing Twitter’s suggestion that 3rd party developers stop creating new Twitter clients (more at Ars Technica) and he wrote a blog titled Thoughts on an open Twitter replacement: Concentrate on what’s done poorly. Below is my response to both his posting and Twitter’s actions. Not to defend Twitter’s recent actions, but this is just the next step in the evolution of Twitter from a social service to a becoming a destination. As Twitter’s popularity has grown, they need to change to support their new users. 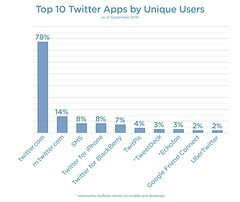 They are no longer targeting the early adopters and the techies that helped Twitter grow during it’s early years. There was hints of this last year during the launch of the “new” Twitter and earlier when they bought/rebranded the most popular 3rd party app as official. No doubt Twitter is looking at how users experience Facebook through the official sites and apps. There are alternative Facebook clients but no one is using them, so if Facebook killed access to these clients there may be some rumblings from a few developers but overall no one else would care. Based off the numbers provided by Twitter in September this may already be true for Twitter as well. The thinking then was that users of these alternative clients were the power users and creating the lion’s share of the content seen on Twitter so it makes sense that Twitter is still in support of 3rd party apps for adding content. Overall Twitter can be improved and the third party apps have help fill these voids. I like some of the idea posted and it’d be great for either Twitter or other service to bring these to the forefront. At the end of the day most users may not be directly effected by this latest change, at least not immediately. In the long-term this will change how and what Twitter is and how it gets used. In the short-term this seems to be about Twitter trying to take control of their service and finally make some money off it, which they have every right to do. I don’t agree with their tactics and it does make me wonder: if the 3rd party apps were such a small percentage of the users, what does Twitter gain by cutting them out of the equation?